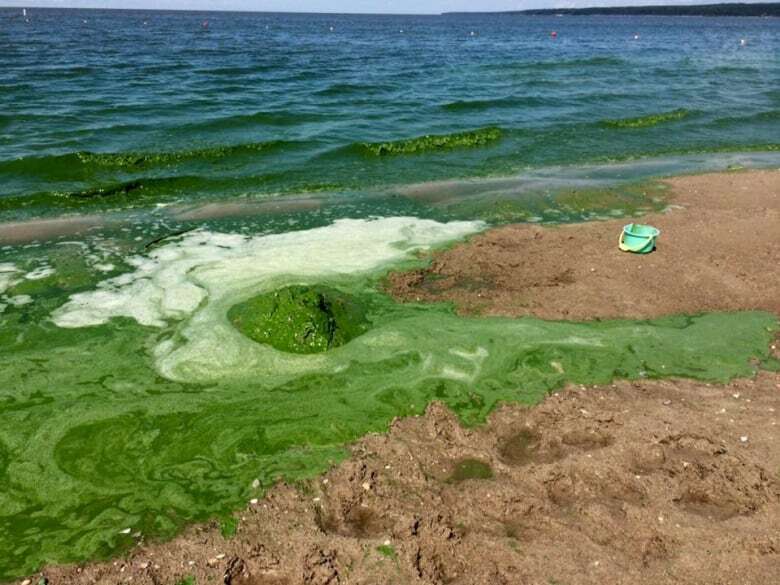 A thick layer of algae blooms covered a long stretch of Grand Beach on Monday. 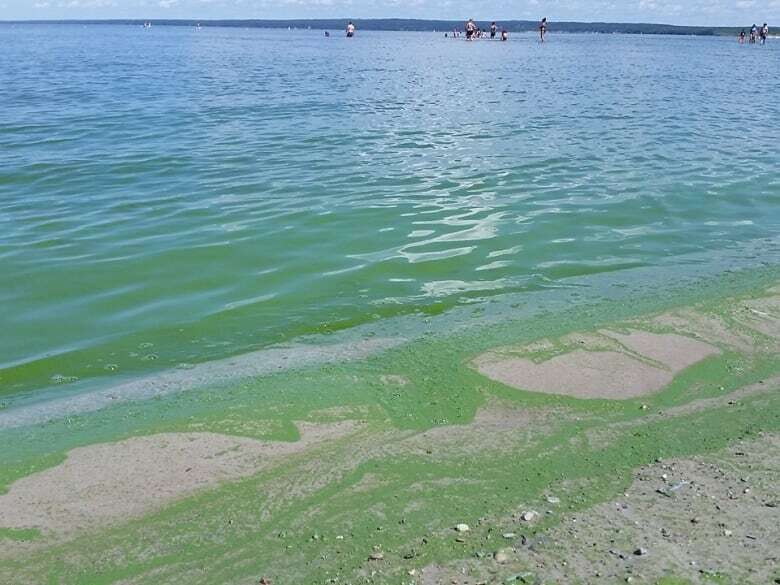 A thick layer of bright green sludge covered a long stretch of Grand Beach on Monday. Beachgoers said the shoreline was coated in thick algae from the West Beach almost to Lester Beach, which is a few kilometres away. "It's very sludgy, very thick and it, honestly, just reeks, especially with the heat and the wind coming off the lake," said Harley Hudon, a cottager in the area. "It's quite a nasty stench." Hudon went to the beach with some friends hoping for a swim on Monday afternoon when he found the beach covered in the slime. "There was quite a few people doing what we were doing, just kind of in awe and walking along the beach and looking at [it] in disbelief. But there was also some people who were just swimming as if nothing was wrong," said Hudon. 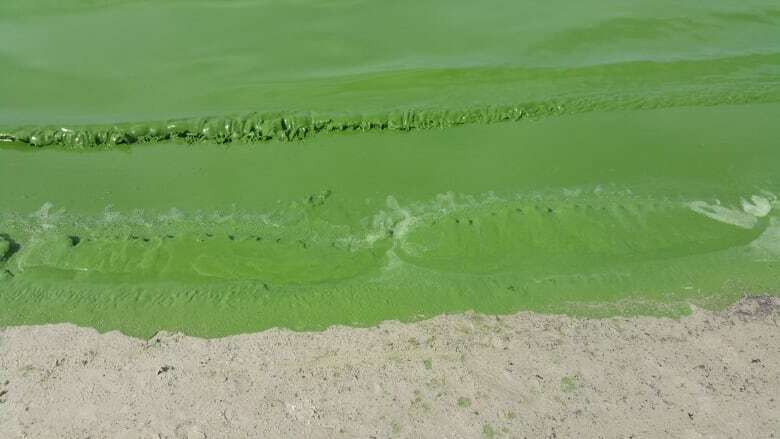 Gabie Tolkmitt said that from a distance the water looked 'tropical', but once she got closer she realized it was full of algae. (Gabie Tolkmitt)Hudon said he walked quite a distance down the main beach and the algae stretched over a kilometre or more down the shoreline. Hudon said he was just there swimming last Sunday and there was no trace of the goo in the water. Another cottager, Gabie Tolkmitt, has been going to Grand Beach for thirty years with her family. She said she gets out to the beach about twice a week and has never seen it quite like this. "It was pretty thick. I've seen algae there over the years and it comes and goes ... but today it was just really gross," said Tolkmitt. "I've never seen it this bad. This was pretty disgusting," she said. Tolkmitt said it is normal to get algae in the water this time of year and sometimes it can last a few days depending on the weather. Monique Andrew and her two daughters drove out to Grand Beach from Winnipeg on Monday. She said she wasn't aware of the algae until she got there, but decided to stay anyway. "It was so bright green it was neon," said Andrew. "And as far as I could see the shore on either side it still looked green all the way down from West Beach over as far as I could see to, about Lester Beach. It looked all green. Monique Andrew and her two daughters played in the sand instead of the water on Monday, after thick green algae covered the shores at Grand Beach. (Monique Andrew)"It was disappointing for sure," she added. Andrew said there was a warning sign between the parking lot and the beach but she didn't notice it until after. She said after driving all the way from the city it was too late to turn around so her kids played on the sand dunes instead. Andrew said she and one of her daughters put their legs in the water but couldn't do any swimming. "When we did go in, your feet just instantly disappear," she said.